Left to Right: (first row): Mike Bratz, Ronnie Lester, Quintin Dailey. 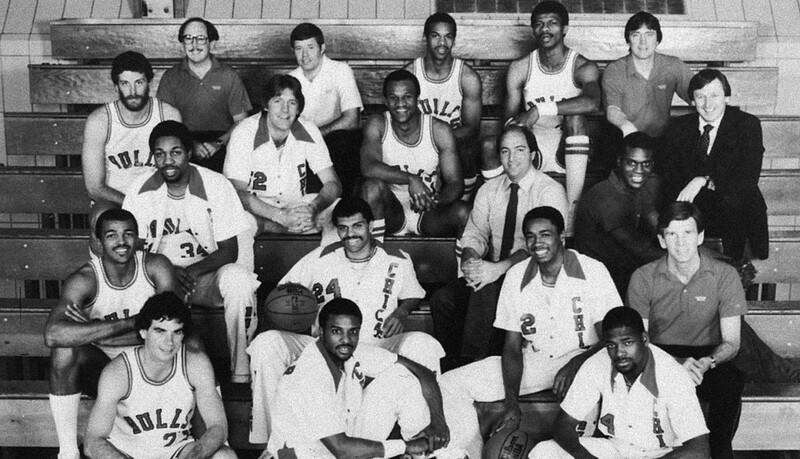 (second row): Dudley Bradley, Reggie Theus, Rod Higgins, Head Coach Paul Westhead. (third row): David Greenwood, Vice President/Operating Officer Jonathon Kovler, Orlando Woolridge. (fourth row): Dave Corzine, Mark Olberding, Tracy Jackson, General Manager Rod Thorn. (fifth row): Assistant Coach Mike Thibault, Trainer Mark Pfeil, Larry Spriggs, Jawann Oldham, Assistant Coach Don Casey. Named Paul Westhead Head Coach, Don Casey and Mike Thibault assistants ... traded Artis Gilmore to San Antonio for center Dave Corzine and forward Mark Olberding ... lost free agent Ricky Sobers to Washington ... lost all seven games during first extended road trip to fall out of contention ... beat Milwaukee for first road win after 10 straight losses (12/08/82) ... Reggie Theus scored career-high 46 points in 140-131 loss at Boston (12/22/82) ... lost Orlando Woolridge for final 25 games with torn knee ligaments ... Westhead fired following 28-54 season, second worst in team history. First round, Quintin Dailey (USF); second round, Ricky Frazier (Missouri), Wallace Bryant (USF) and Rod Higgins (Fresno State). Failed to qualify for second straight year. Dailey and Higgins named to All-Rookie First Team.